The Eveready Shed Utility Light illuminates the interior of your shed, cellar or garage – anywhere without mains power – simply, affordably and efficiently. 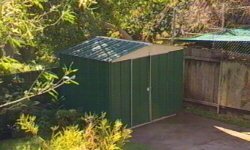 There are two main components of the Eveready Shed Light. 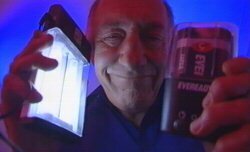 The lantern itself with twin high-output fluorescents tubes and the battery pack, which takes a big 6 volt battery. Twin inverter technology for maximum battery service life means an Eveready Energizer 529 Lantern battery will power the Shed Light for up to 30 hours – so it’s very affordable. And the cover fits on snugly. Of course, the Eveready Shed Light is so versatile, it doesn’t have to spend all its time inside, stuck on the wall. Whenever and wherever you need to see what you’re doing, the Eveready Shed Light is there to help. If you’re working on the car, you can plug it into the cigarette lighter, with a 12 volt DC socket. Just think how often you could use a portable, dependable, bright light when you’re nowhere near mains power. You can use it on the boat, up in the roof, down in the basement, in the caravan, under the stairs or when you’re away camping. Because its Australian designed, it’s built to last. Tough, durable – ideal for any indoor situation – and comes with a lifetime guarantee. The Energizer/Eveready Full Lifetime Warranty says the product will be free from all defects in workmanship and materials for the entire life of the lantern – does not include the fluorescent tubes.